If you are married to a disobedient husband, you are not alone! Read about Abigail’s husband. Now the name of the man was Nabal; and the name of his wife Abigail: and she was a woman of good understanding, and of a beautiful countenance: but the man was churlish and evil in his doings; and he was of the house of Caleb (1 Samuel 25:3). I loved the description of Abigail so I thought I would study it further since she didn’t seem to lose her “beautiful countenance” even though she was married to a “churlish” (selfish, unfeeling, rude, rough in temper) man. Whenever I read about a woman with a sunny and cheerful disposition, I think to myself how much I want to be known for this but the unique quality about Abigail was that she was able to keep this beautiful attitude in spite of being married to an evil man. How? She put her hope and trust in the living God and not upon her husband or the state of her marriage. Therefore, she was able to keep her joy in the Lord and bring gladness to others. Look what the Apostle Paul wrote while he was in a prison dungeon. Rejoice in the Lord always: and again I say, Rejoice (Philippians 4:4). We can’t hope to find our joy and happiness in our circumstances, our husband or marriage because these will at times cause us conflict, heartache, and/or sorrow but Christ never will. He is the same yesterday, today, and always. My viral post is going viral again. It’s tragic to see how many angry, mean, and crass women there are today. They have no clue what being women of discretion and goodness looks like. The words that are being written on my Facebook page in the past few days are disgusting. Foul language spews out of their mouths and they have no problem ridiculing and trying to destroy others. I can tell you one thing about them, they have no joy. They aren’t cheerful because they can’t be happy while being so angry. They feed on being cruel and unfeminine while going around with a scowl on their faces and hating the ways of the Lord. This type of behavior should have no part of our lives, women. When we disagree with someone, no foul word should ever exit our mouths. We are to be defined by kindness and speaking the truth in love. We are to hate what is evil and cling to what is good; for when we are clinging to the good, we will most likely be cheerful and joyful as we remind ourselves that the joy of the Lord is our strength. I watched a movie the other day about a sad and disheartened man who began to spend time with a very cheerful woman. She changed him and it wasn’t by trying to control him. 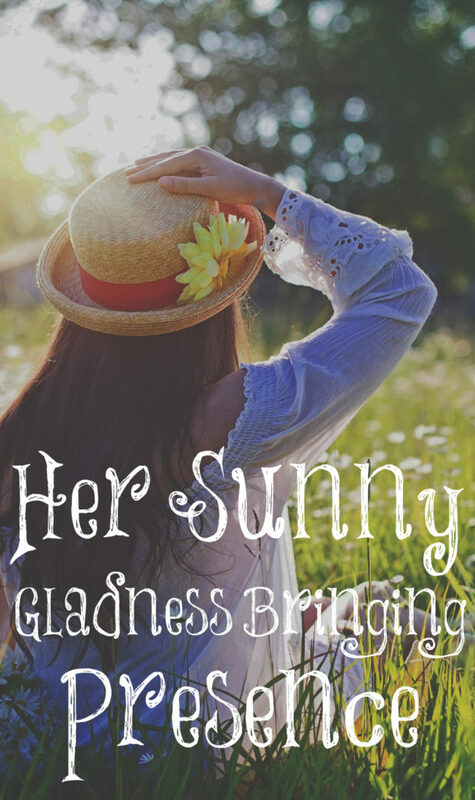 Her sunny disposition brought joy and happiness into his life. Do you bring joy and happiness into your husband’s life and other’s? Being joyful is a choice you make each and every moment. You can’t be joyful if you are critical and controlling so give up those ways and choose joy! Sing and make melody in your hearts unto the Lord even if you are married to a churlish husband or in difficult circumstance. My husband and I actually just had a discussion about this a couple of days ago…I have a tendency to “pout” when things don’t go my way, which has happened quite a bit lately. I have purposed to break this habit and I can already tell a difference in our home. Great post and oh so true! It’s a good thing that you are getting rid of pouting, Nita, since it’s isn’t a good thing to do! Thankfully, you recognized it and are working on ridding it from your life. Is your FB page public? I too am sad that these women are so far from what God wants them to be. May all of us women look to Him and His Word for our pattern and not the evil deception of our hearts and Satan. Yes, it’s public, Michelle, so I get a lot of mean and nasty comments. God’s Word is our only source of truth in the midst of this perverse culture so we must hide it deeply in our hearts. Needed this today, Lori. Thank you!!! Please don’t laugh – I know it’s June. But the best way I know to cheer myself up is to sing (in my head or out loud) “Joy to the World”. Yes, it’s a Christmas carol. But it sure does work! You told me this the other day and I can’t thank you enough for your words o wisdom. It’s true, Christine, for God tells us that those who love the Lord sanctify those in the family. They see Jesus living in and through you. This is the most powerful thing in the world since God is the Creator of everything! We love the story of Abigail. We named a daughter after her. She is smart, tough, bold, brave, independent, listened to the voice of the Lord and stuck tight to the right path. Abigail did not sit sweetly by while her husband continued in his wicked ways, however. She did not pay him lip service “honor” to make him look good to other people. She saw the disaster coming. “Abigail acted quickly. She took two hundred loaves of bread, two skins of wine, five dressed sheep, five seahs of roasted grain, a hundred cakes of raisins and two hundred cakes of pressed figs, and loaded them on donkeys. Then she told her servants, “Go on ahead; I’ll follow you.” But she did not tell her husband Nabal. She did not put up, suppport or agree with her wicked husband. She couldn’t leave a bad situation but behind the scenes she got stuff done. Abigail told David that her husband was a fool and not worth killing, and that he should accept the supplies she brought rather than carry out his plan for revenge. David agreed. In this whole event, Nabal’s a fool and Abigail keeps her head and saves the day. Wicked Nabal dies soon after and Abigail marries David. From the interaction with her servants it looks like she already managed Nabal’s operations and it’s possible David took it all for himself when he married her. Yes, Abigail was a wise woman. Brian and Lori, This is actually one of the reasons I have struggled understanding the Abigail story in context of being a submissive wife though. I believe the reason we are instructed to be as daughters of Sarah (instead of Abigail) is because Abigail didn’t really behave that way or model it well. She wasnt submissive, she went behind her husbands back and against his authority and spoke ill about him… yes it comes across heroic but it was also rebellion towards her husband. I often wonder if nust maybe she did submit to him and didnt go behind his back and instead prayed for Nabal if God would have stepped in and changed her husbands heart and spared his life, which in fact would have kept their marriage together and Abaigail from being one of Davids many wives… The story goes on to say it was after Abail told Nabal what she had done that his heart failed him and he ge became like stone, and God finally let him pass away 10 days later… to me that’s sad, it speaks volume of the betrayal he felt from his wife, was he very foolish? Yes, scripture tells us that but God can change a heart so It’s a story that perplexes me since it clashes with other passages about the role and godly character of a wife and honestly doesn’t match up, yet God allowed it in his word so I know there is purpose in knowing that story. For instance God is a jealous God and that is righteous but we are not called to be jealous because human jealousy causes unrighteousness. So in the case of Abigail I think it would be the same as if your husband was asking you to sin. You would never submit to our husband’s that were asking us to sin. Nabals behavior would’ve wiped out her and her whole family. She saved her family. Interesting take on the story Ginnie. I would like to know what others think of that as well. Abigail was fully submitted to God, first. Her husband was a wicked man who was sinning aginst God and his ways and she could not follow but instead did the right thing, leaving her husband to rightly (and biblically) reap the consequences that he sowed. Abigail’s story is a good example that Godly submission is not to be blind submission, but submission putting God and his ways first, and that we are not to enable wicked men in their ways. The post today is not on submission, but is on the dignity and joyful disposition of Abigal. It may also be wrong to judge Abigal as not being submissive when she goes against her husband and surely saves her men and boys from the death that surely awaited them. The fact that God struck Nabal after Abigail told him of her disobedience surely seems to show that God judged him unworthy of redemption and nothing she could have done would have changed that. 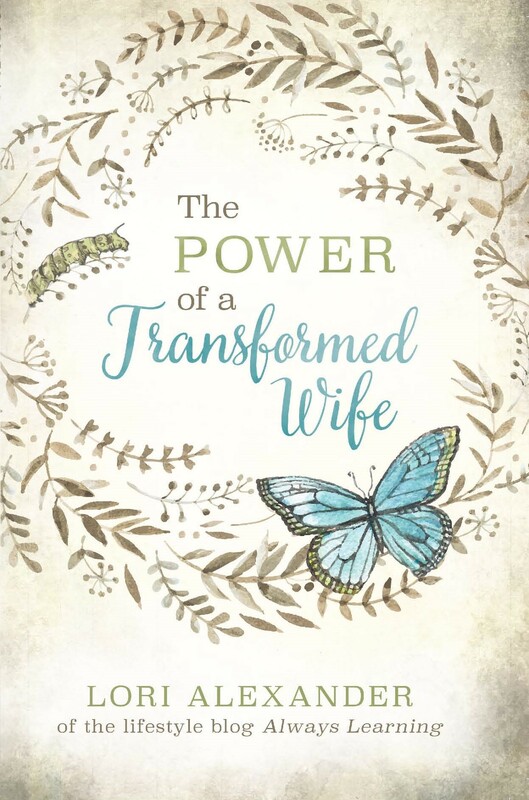 To think that if Abigail may have been able to win her husband by finding another way to appease David’s anger is to read too much into the story that is too brief to know anything different than that God blesses her greatly by her willingness to honor her future King. There is never a perfect example of anyone in the scriptures except for Jesus. Everyone of even the greatest saints is not a perfect example for us to follow. Thank you for replying Ken, Brian, Anon and Marie! I guess I just tend to look at the story differently than most, in regards to saying her husband was in a terrible sin and she saved her family by not doing as he would have, I somehow just don’t see that connection. He basically chose not to donate his OWN food and possessions to David and foolishly spoke about him disrespectfully even though David had done nothing wrong and provided protection to the land… but it was David who lost his anger, ready for vengeance to kill not only Nabal but ALL the innocent men bc he was denied a (freewill) offering for his service… none of what Nabal did was sin per say (in my opinion), it was stupid n we can agree it was selfish and rude which is a root of sin so sin was in his heart.. but in a situation like that, I personally would think it’s right to submit to my husband and pray God spares us… or at least that’s what I think I would feel is right, this is where my pondering of “what if” Abigail did submit stems from. So that’s where I’m coming from in saying I struggle with it, not that your points aren’t valid or correct but just that I have a hard time seeing it through that lense as I personally can’t see what Nabal did as a huge sin… if anything I see David ready to shed blood of innocent people due to one man’s folly and the wife running to David and taking his side, calling her husband names and requesting David remembers her when God deals with Nabal, who does have his heart die as soon as he hears of his wife’s doings and when he died. It’s a perspective I don’t think I’ve ever heard before, but wrestle with seeing it any other way. I will keep hoping it clicks for me one day lol bc like I said I know God put those events in His word! Thanks for the feedback and conversation ? The loveliest Christian women I know are always joyful and happy, always smiling, because they have the love of Jesus in their lives and they love the Lord and His ways. A great reminder to start off my morning, Lori, thank you! My life has become complicated recently and I have lost my joy. Thank you for this post. I am praying I can find my joy again.